AEI provies a free ISO Alert service that sends email and text messages to subscribers whenever a regional grid is approaching a new annual peak in the current financial year. The financial year is defined to coincide with the Forward Capacity Market (FCM) auctions which set payments to load-serving entities (LSE) in exchange for their commitment to be available to meet the projected demand for electricity three years out. That delivery period is called the capacity commitment period (CCP) and is a one-year period from June 1 through May 31 of the following year. We use the same date range because ICAP tags and the demand charges that flow from them are typically fixed for the duration of a financial year. 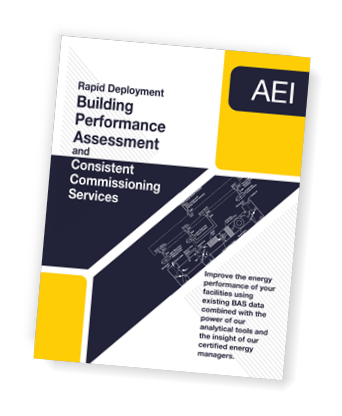 In the course of providing this service, AEI collects real-time data published by regional transmission organizations (RTO) and independent system operators (ISO) in the U.S. and U.K by way of programming interfaces provided by each RTO or ISO. Depending on the service, the data may be available in 5-minute, 15-minute, 30-minute or hourly increments. In addition to the real-time loads, we also collect hourly forecast demand data which is typically available one to 10 days into the future. The AEI ISO Alert service operates year-round but is typically dormant during U.S. winters and U.K. summers when the likelihood of annual peak hours is lower. In the U.S., AEI ISO Alerts will resume full services on Monday June 18th and continue until September 30th, 2018 and provide coverage for ISO New England, NYISO, PJM, Mid-Continent ISO (MISO), and CA-ISO. The first two or three weeks of the financial year - or "cooling season" in the U.S. - are useful for shaking out the service as it tries to establish a new reference level before it issues any alerts. We use 90% of the lowest peak load from the past 3 years of history to establish the reference level. The goal is to send out meaningful alerts that match the RTO or ISO forecasts such that any demand response is statistically justified. The commencement of our service is signaled by the delivery of a morning report before 9:30am each weekday which reiterates the RTO or ISO forecast for the day, combined with our assessment of the likelihood that a new peak might be reached. Our service will send text or email messages when loads are within striking distance of a new peak in the next few hours, and we use historical error rates for each of the ISOs when assessing our risk rating. For reference, the following tables shows peak levels reported by each ISO for the past few years. Please note that these are technical peaks reported by the respective real-time service from each ISO and may not necessarily coincide with the peak annual hour. To learn more about the Independent System Operators in the U.S., visit the FERC website. Visit our AEI ISO Alerts web page to learn more or to sign-up for this free service. Contact us to incorporate our API into your downstream applications, or for additional information about how we can customize the alert service for your purposes. 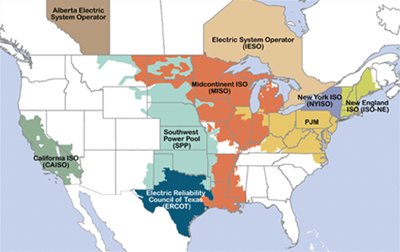 A map of Independent System Operators, the governing authorities for electric power distribution in North America. Extending its free and popular ISO Alerts service for ISO New England and NYISO, AEI recently added coverage for PJM, MISO and CA-ISO. With the addition of these three grid operators, AEI now provides near real-time SMS and E-Mail alerts to customers covered by 5 of the 7 major ISOs in the U.S., responsible for the delivery of electric power to nearly 65% of America. It plans to provide coverage for ERCOT and SWPP in the very near future. AEI has built interfaces that connect to the web services of each ISO, retrieving their real-time loads and forecasts every 5 minutes. It then compares the current load and daily forecast to its database of historic load data for each ISO to determine if new peak conditions are imminent. When there is a significant risk of hitting a new peak load, users of the service receive a text message or e-mail to alert them of the condition 2 to 4 hours in advance of the approaching peak. The service includes the delivery of a Morning Report for each ISO that rates the probability of a new peak each day which takes into account the historic ability of each ISO to accurately forecast the day-ahead loads. For customers on a utility rate tariff that has a demand component based on a facility's peak usage, this service is a zero-cost way for managers to avoid a coincident peak with the grid, thereby reducing their apparent load at the time the ISO declares the installed capacity hour for the year. Visit AEI ISO Alerts to learn more and sign-up for this free service. In a presentation to 33 partner cities on July 12th, AEI joined with ACEEE, DNV/GL, Hatch, Philips and the U.S. Green Building Council to talk about our respective commitments to the Better Communities Alliance. For it's part in the initiative, AEI will be delivering its core Energy Map, Soft Start and ISO Alerts solutions to all buildings in a portfolio, with options for significant discounts on its Soft Start Real-Time metering solution. The first five selected partner cities will be receiving the Energy Map and Soft Start at zero cost for the first year of operation. For U.S. DOE Partner cities, read more about the AEI Better Communities Alliance commitment. For more information about the U.S. DOE Better Buildings Initiative and the Better Communities Alliance, visit betterbuildingsinitiative.energy.gov/bca. Learn more about our AEI Energy Maps or contact us to schedule a 30 minute web conference specifically designed for you and your team. AEI has been selected as a Massachusetts Higher Education Consortium (MHEC) supplier to provide Facility Maintenance and Energy Assessment Software to MHEC members through June 2020. The letter from MHEC reads: "Your bid response was evaluated and determined to be the most responsible and responsive bid that offered best value to MHEC members". As an approved vendor to MHEC, AEI is offering significant discounts on its entire product portfolio to higher education member facilities in Massachusetts, Maine, New Hampshire, Connecticut and Rhode Island. With this award, AEI will be able to design integrated and custom energy information solutions that deliver energy and water usage baselines and trending, time-of-use energy profiling, real-time metering, tracking of greenhouse gas emissions, and benchmarking to national standards. The design goal is always to deliver insight that yields energy savings opportunities with less than one year payback, and baselines and cost-to-operate models that support capital planning decisions for more extensive opportunities with decent payback. With our novel low-cost approach to real-time metering, energy managers can monitor the building loads across an entire campus in real-time, positioning themselves for better response to peak demand conditions and other operational states where energy use is particularly acute or expensive. This includes text message and e-mail alerts when individual buildings are nearing billing period peak levels that can have significant negative effects on the monthly utility bill. Real-time metering also enables rolling profiles, quickly identifying wasted energy being consumed during unoccupied hours at individual buildings. For more information, MHEC members can visit our MHEC Solutions web page or contact us to schedule a 30 minute web conference where we can walk through selected examples and discuss the specific options for your facilities. To learn more about membership in the MHEC, interested institutions should visit the MHEC at www.mhec.net. This AEI Energy Map brings together a wide range of energy and property data from City of New York PLUTO, LL84 and NY ISO Real-Time feeds to offer an interactive way to inspect and compare utility usage at individual facilities and compare building classes to get a real sense of how 13,000 buildings covering 1.8 billion square feet are performing in terms of electricity, oil, gas, water and their resulting GHG effects. Visit the Energy Map at www.aeintelligence.com/city-of-new-york. AEI has delivered an Energy Map explorer that shows energy and water usage in the City of New York for over 13,000 buildings and 1.8 billion square feet across a wide range of builting types from office buildings to multi-family housing. The explorer is available online at www.aeintelligence.com/city-of-new-york. AEI developed this visualization as a follow-on to its work building the City of Boston Energy Map to demonstrate that size matters. 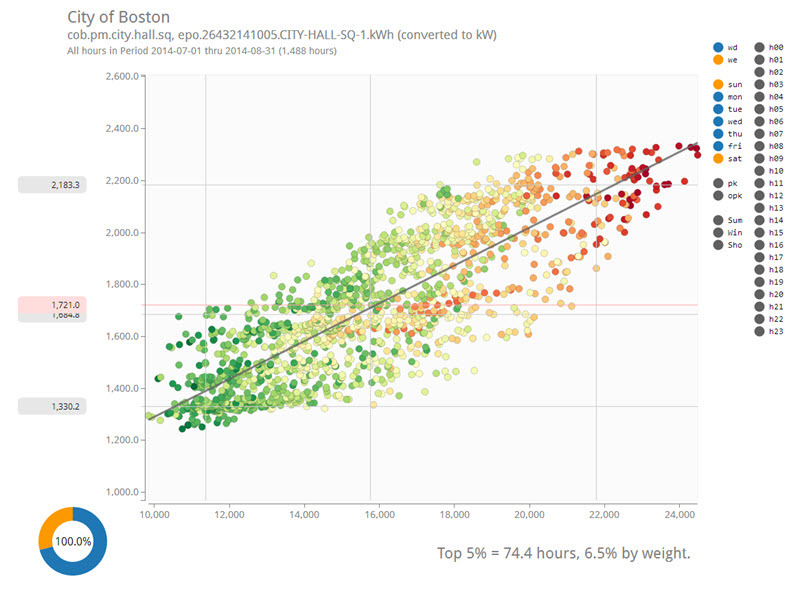 With a twenty-fold increase in the number of buildings in scope we can get a much more relevant picture of the energy footprint in a large city that deemphasizes artifacts in the reporting (municipal pools in Boston skew their results because of the small sample size), at the same time it improves the year-over-year progress reporting which is instrumental to achieving the City's 2025 and 2050 GHG reduction goals. With a broader and more accurate baseline, the effects of the cogeneration effort at NYU in reducing GHG emissions stands out all the more when the peer group is large. For the individual building owner in the multi-family housing sector, is my high EUI compared to the other 8,000 buildings a reporting issue or should I be considering a significant renovation to make my rentals more competitive? With the high penetration of district steam in Midtown Manhattan, should city planners focus on this vital energy asset for infrastructure improvements or further leverage it because of its relatively low cost in terms of GHG emissions? As a Microgrid solutions provider, do clustered MFH buildings with a single owner offer an opportunity to improve their energy profiles and reduce their reliance on grid resources? Questions like these are an inevitable part of the discussions that lead to more enlightened energy policies that have duly considered the trade-offs, costs, and political challenges associated with achieving the goals that are so easy to set when they are 30 years away. In the meantime, reporting mechanisms such as LL84 in New York, BERDO in Boston, and the increasing trend toward disclosure reporting requirements in hundreds of other cities and towns in the U.S. make the data more reliable and at least suggest the possibility for a common reference point for a wide range of constiuencies to use when asking such questions. Our goal with an AEI Energy Map is quite simple. It's to assimilate your data sources - from annual utility reporting to real-time building interval data - and present them in a way that lets you ask and answer the questions that are important to you. From the portfolio level down to the individual building performance level. Rinse and repeat each reporting period so that you have measurable trends and feedback for your goals and achievements. How does this help portfolio managers save energy? And there's support for widget integration with town websites can help drive awareness and social behavior at a high level, with trouble ticket support at the individual facility level. For more information or to put your portfolio on an Energy Map, contact AEI. The Energy Map is an interactive explorer for energy and water use at over 450 facilities in the City of Boston. The Map brings together a wide range of energy data sources for a consolidated and consistent view of each facility, how it ranks compared to its peers, and its contribution to the total use in each of the departments in Boston. By integrating billing data and utility interval data, the Map is a logical entry point into the deeper insights of commodity use in each individual facility. 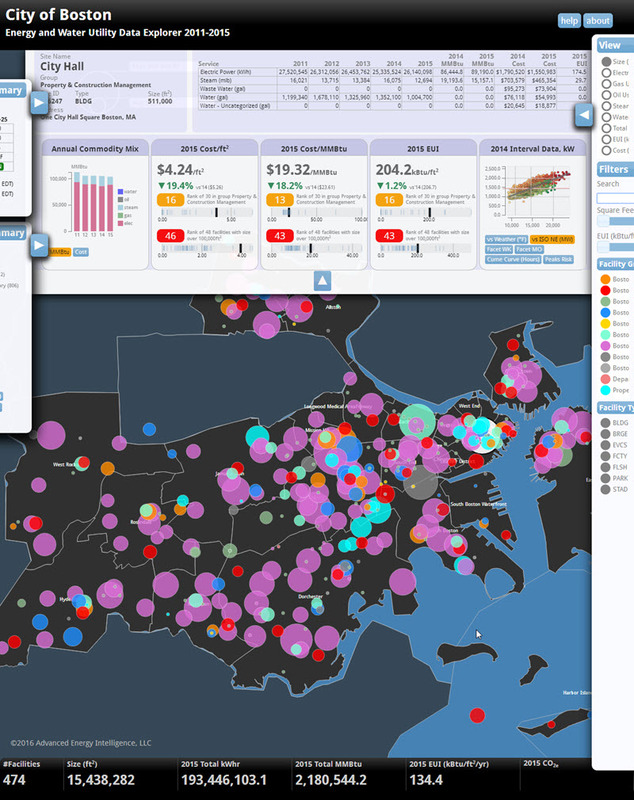 Visit the Energy Map at www.aeintelligence.com/city-of-boston. AEI has delivered an Energy Map explorer that shows energy and water usage in the City of Boston for over 450 buildings and 15 million square feet in the Boston Public Schools, Fire Department, Police Department, Public Library and Public Works. The explorer is available online at www.aeintelligence.com/city-of-boston. AEI developed this visualization as a demonstration of how it will deliver similar results for other cities, towns and property portfolios so that administrators and facility managers can comprehensively explore their energy usage. A comprehensive energy exploration tool is vital for understanding portfolio-wide usage and costs that can drive discussions with utilties, aggregators and facility managers. They can learn how their buildings stack up against the DOE and Energy Star national averages, by commodity, season and facility type. Ranking facilities by EUI, per square foot, and costs helps target resources to the energy efficiency opportunities with the best ROI. The Energy Map is a consistent entry point into facility details such as billing records, building automation system (BAS) data and analytics, utility interval data and peak demand analytics. With daily and weekly updates, it's an O&M view at the facility level that can help facility managers react to weather, occupancy and variables at the HVAC level. Support for widget integration with town websites can help drive awareness and social behavior at a high level, with trouble ticket support at the individual facility level. Working with its partner Guardian Energy Management Solutions, AEI is developing this model for the specific towns covered by recently awarded Green Communities funding. Compatability with a wide range of data sources including Green Button, MEI, EPO and building automation system data from Siemens, Honeywell, JCI, SkySpark and many others makes it easy to deploy for other towns, campuses and large property portfolios. This chart shows Boston's City Hall electric demand (y-axis, in kW) versus the ISO New England regional demand (x-axis, in MW) for the months of July and August 2014. While the facility doesn't have perfect load correlation with ISO-NE or weather, it does track closely enough to warrant some demand response on those days where the grid will pass 23,000MW. Pushing the facility load down to its 95th percentile during a 5 hour period on July 2, 2014 would have reduced City Hall's ICAP tag for FY16 by about 10% and would have saved at least $8,000 in demand charges in just July and August 2014 alone. Sign up for ISO New England SMS and E-Mail alerts to receive timely notifications of when the grid may be hitting a new annual peak. We'll send you a 9:30am "set up" message for the day's expectations, and then an alert if the grid hits a certain threshold during the day. Learn more and sign up at our AEI ISO Alerts page. Demand Charges and Your Utility - What's Happening? With the dog days of summer well underway, it's most likely that the ISO New England electrical grid will hit its annual peak demand hour sometime in the coming weeks. A facility's coincident load at the time of the ISO-NE peak is used to determine its installed capacity "ICAP" tag, and that in turn is used to calculate the capacity charge for the facility's FY18 electric utility bills. The rates per peak kW have been set and are non-negotiable: $3.43 last year; $6.66 this year, and moving to $15.00 next year and $9.55 in FY19. For facilities on a time-of-use electric utility rate such as the Eversource B3 or National Grid G-3 schedules, demand charges based on peak usage can amount to more than 50% of the monthly electric bill depending on its commodity supplier contract. And even if you are in a multi-year contract that features price protection against these increases, some contracts will discount your rate if you are able to reduce your peak demand. Learn your facility's daily, weekly and seasonal load profile from your EPO data. Understand the individual components of your utiity rate schedule and commodity agreement. Get ISO alerts from ISO itself, MAPC, or a new free AEI ISO Alerts service that will send you SMS messages or email when peaks are imminent. Develop a DR plan for those days when load shedding can have the greatest impact on your monthly electric utility bills. To put it bluntly, doing nothing is highly unlikely to be the best option for avoiding significant increases in your electric bills over the next several years! Given these escalating and non-negotiable rate increases or, conversely, the opportunity to get a discount by reducing your ICAP tag, the urgency for this summer is to be on alert for probable ISO-NE peak hours and have a demand response plan in effect for those times. The ICAP tag assigned to a facility during this summer is used in the calculation of demand charges for next year's bills. Once the "peak hour" urgency passes, there is still a substantial opportunity for savings each month by knowing a facility's occupied weekday profile so that monthly peaks can be can be avoided. For a facility with a 1MW average load, it's not unusual to see peak usage that is 3x or 5x the average. It is very reasonable to see a facility reduce their monthly peak by 5% - say 200kW - and save over $5,000 on a single monthly bill. Contact AEI for a quick review of your utility bills and to be notified when we see a high probability of ISO-NE hitting its annual peak hour. The grid has already passed within 1% of last year's annual peak when it broke through the 24,000MW level back on July 22th in the 5pm hour thanks to an afternoon of temperatures above 90°F. With peak hours trending toward the later parts of the day, minimizing a facility's ICAP tag doesn't necessarily have to come at the expense of building comfort. Once you understand the components of your electric bill and the opportunities for lowering those costs associated with demand charges, AEI can help you with the next logical steps. We'll profile the facility's average week, average day, examine its response to weather by season and degree-days. We'll look at night and weekend setback as well as its behavior under varying occupancy levels and can even infer a building's base load as a reference point for other less obvious opportunities. And if you're sub-metering the facility we can guide you on your demand response options when we know the individual circuit loads serving the facility. Reducing your peak demand during the ISO peak demand hour is like a big birthday gift, but reducing peak demand every month is the gift that keeps on giving and can easily exceed the annual value of a reduced ICAP tag. So Much Data, but Who Can Analyze It? A survey of utility managers by Oracle reveals some startling gaps between the amount of smart meter data that is collected and the ability to analyze it. A Carbon Trust study has demonstrated that SMEs using advanced metering can identify an average of 12% carbon savings and implement an average of 5% carbon savings through reduced utility consumption.